The year is 1962, and fourteen-year-old Harry Hodby lives in a small town in Australia. His mother died when he was seven, his friend (and potential girlfriend) Linda was swept away in a flood, and he, along with his father and younger brother Keith, are left to sort out their hardscrabble lives, coping with poverty, jealousy, anger, and despair. It is Harry’s deepest goal to leave this town for a better life, but he knows that people who leave this town never come back. A novel in poetry written by one of Australia’s most popular poets, this is a deeply moving and haunting depiction of adolescence. Once I read through the first five or six poems, I was hooked, and read the rest of the book in one go. We do not do nearly enough with poetry in our English classes, and while that is reason enough to recommend this book, I recommend it because it is beautifully written, with an intriguing story that links these poems together. These are highly accessible, yet complex, poems. I challenge anyone to read the following two selections and not want to read the rest of the novel. and swim to the middle. My breath is slow in my ears. hopping silently around the yard. and I check my watch. Not in the cool dark. 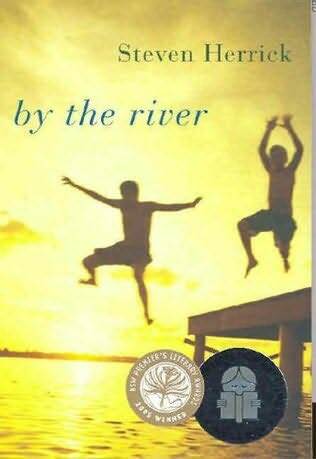 By the River has won the Ethel Turner Prize for Young People’s Literature and was named a Children’s Book of the Year Honor Book for Older Readers by the Children’s Book Council of Australia. You can visit Steven Herrick’s website here, and can purchase a copy of this book from Amazon here. Herrick, Steven. By the River. Asheville (North Carolina): Front Street, 2004.